After completing undergraduate degrees in English Literature and in Computer Science, Chris Barkerreceived one of the first ever PhDs in Linguistics from UC Santa Cruz, under William A. Ladusaw, in 1991. He has held positions at the Ohio State University, University of Rochester, and UC San Diego, and he is currently chair of the Linguistics Department at New York University. 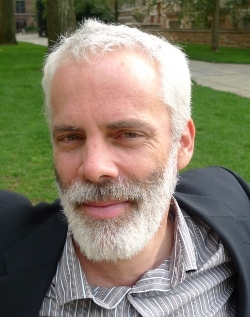 His research applies concepts and insights from theoretical computer science to the study of natural language meaning. His active research interests include scope, vagueness, and substructural logics, applied to phenomena including crossover, "same", sluicing, and dynamic theories of discourse.